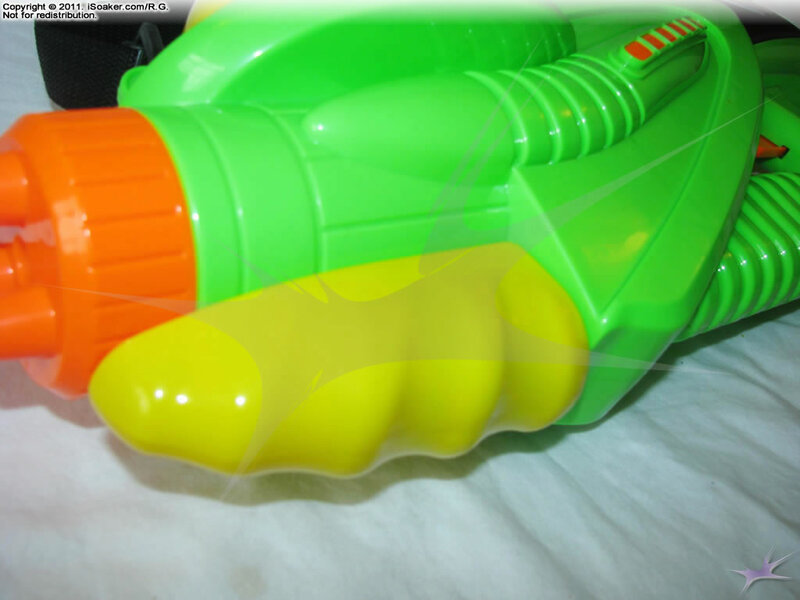 The Water Warriors Sphinx is a Hydro Power-based water blaster released by Buzz Bee Toys Inc. in 2010 for the UK; it is a similar size and performance to the Water Warriors Lightning, but without an electronic power gauge. The pressure chamber on the Water Warriors Sphinx (Hydro Power Version) provides good power to the nozzles. The single firing chamber displays a near CPS-like quality with streams showing notable drop off near to the end of the water level in the pressure chamber. The Sphinx has 3 different nozzle settings ranging from a small nozzle to rather large nozzle. Streams produced from the largest nozzle have a significantly potent feel and seems to push with even more force than that of the larger Water Warriors Gorgon (Hydro Power Version). As expected, the smallest nozzle offers the best level of conservation for this blaster while the middle-sized nozzle have decent performance while not draining the pressure chamber so rapidly. The Water Warriors Sphinx is forward mounted. The grip, itself, has a decent feel and pumping is smooth and typical for a blaster of this size. The pump volume on the Sphinx seems to be slightly less than that of the original Water Warriors Lightning, but as the pressure chamber also seems to be slightly smaller, number of pumps required to fully pressurize the blaster remains the basically the same. As noted above, the Water Warriors Sphinx uses the Water Warrior Lightning's shell, but lacks a functioning electronic pressure gauge. 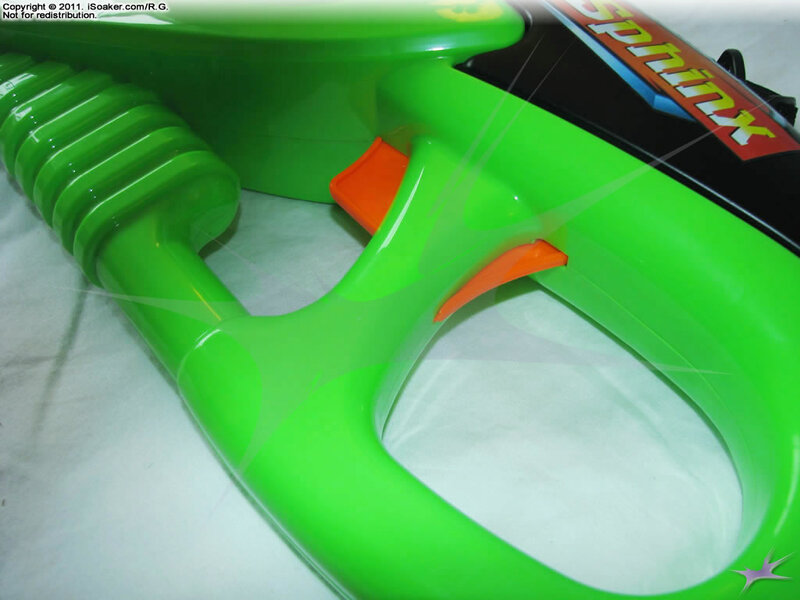 However, since the Sphinx appears to be using the original molds, the trigger for the pressure gauge remains to avoid having a hole at the back of the trigger grip. 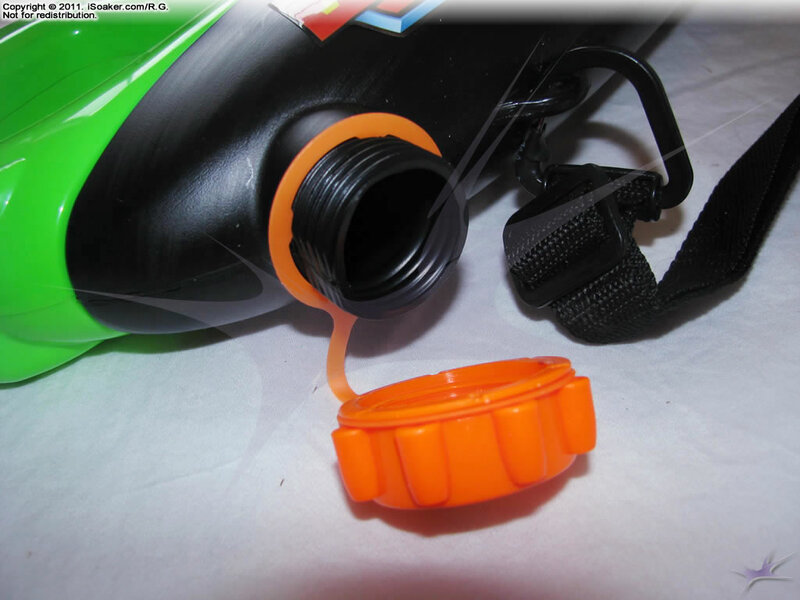 Though some may feel this is unecessary or that a differently shaped piece could have been used, since the back trigger doesn't move, it does not seem to chafe as much. The reservoir on the Sphinx offers at least 3 to 4 additional full charges of the firing chamber before emptying. The intake area of the reservoir is near to the rear of the blaster, thus when water level is lower, tilting the blaster slightly upwards allows one to make use of most of the water. While the Sphinx does make use of all it holds, the fact that the reservoir is opaque makes it a little harder to determine how much water is remaining and one must estimate by weight and sound..
All in all , the Water Warriors Sphinx (Hydro Power Version) makes a solid addition to anyone's armoury. 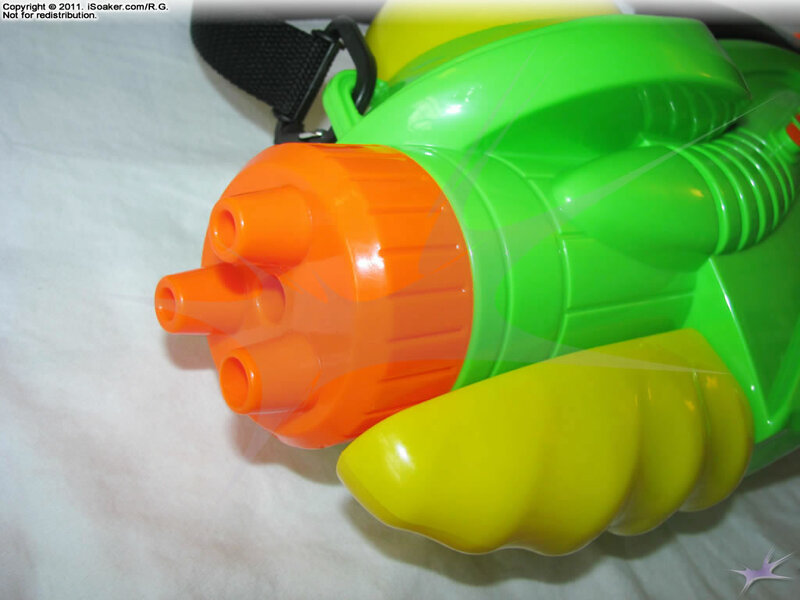 While using, one should still be wary of others using the largest of the CPS-based soakers, but the Water Warriors Sphinx (Hydro Power Version) user can keep pace with anything on the modern water warfare field. Easy to pump, pressurize, and blast away. CPS-like pressure chamber gives good power. Largest nozzle a definite improvement over the original Lightning. Has strap for easier carrying. Multiple nozzles allow the user to drench more or conserve depending on how much water remains. Reservoir opaque and capacity seems a little low for a blaster of this size. Hand grip area around the trigger small for those with larger hands. External reservoir cap tether more prone to damage than an internal string-anchor one. Forward mounted pump more likely to be damaged if left extended.